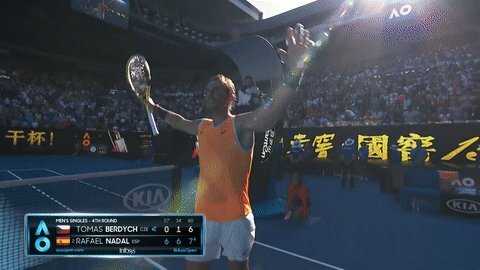 #AusOpen's tweet - "Vamos @RafaelNadal! He def. #Berdych 6-0 6-1 7-6(4) to reach his ELEVENTH quarterfinal here in Melbourne. #AusOpen #GameSetMatch "
He def. #Berdych 6-0 6-1 7-6(4) to reach his ELEVENTH quarterfinal here in Melbourne.